If you don’t set the Eduroam yet, you can use the Wi-Fi pedf-public for the first connection and for the Eduroam setting. Connect and open the webbrowser. In the form use the checkbox „univerzitní“ and login with your university account (CAS). 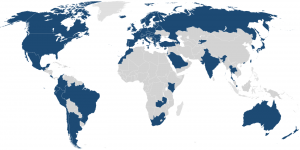 If you already have Eduroam account (e.g. at your home university), you can use the account from your university. Log in with the university account (CAS) at cas.cuni.cz. If you log-in for the first time, you will be asked to change your CAS password. 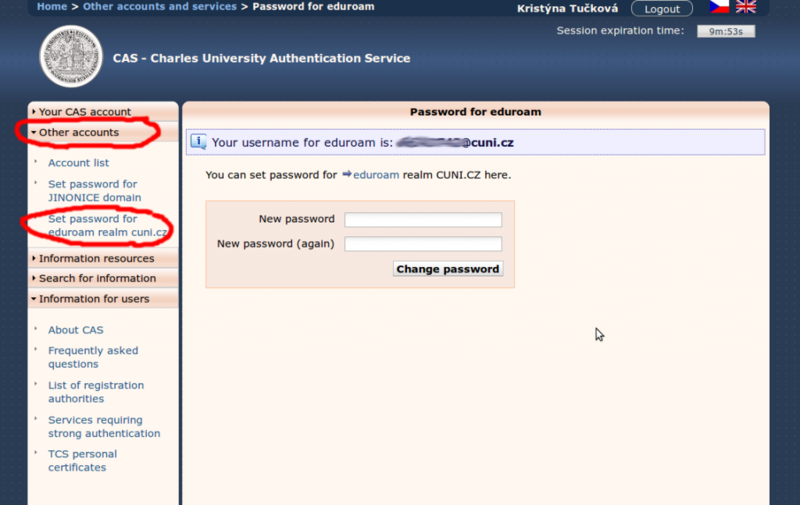 Choose from left menu: Other accounts – Set password for eduroam realm cuni.cz and set your password for Eduroam. You can also show your password if you have set it before (the button “Show your password”). Your login is yournumber@cuni.cz, e.g. 12345678@cuni.cz. You can see your student number under the photo on your student card. If you are at faculty and if you don’t set the Eduroam yet, you can use the Wi-Fi pedf-public for the first connection and for the Eduroam setting. Mobile phones and tablets– usually just connect to Eduroam and fill the login and password. If the connection failed, set the authentication protocol as PEAP and MSCHAP v2. For Win 7 and Vista You can use automatic configuration program: http://uvt.cuni.cz/UVT-416-version1-eduroamcuni.exe. For Win 8 You can use automatic configuration program: http://uvt.cuni.cz/UVT-480-version1-eduroamcuni2.exe. For Win 10 just connect to Eduroam and fill the login and password. Check your password. It is different from your university password. You can show it after login at http://cas.cuni.cz. Not able to set the password at cas.cuni.cz, because I don’t have verified password. Not able to connect Win 7 or Win 8. Download configuration program (see section 3).